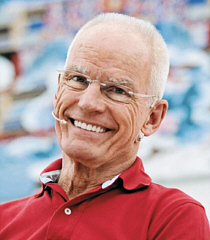 We are delighted to announce that Lama Ole Nydahl will be visiting Helsinki on 12–13 October 2013 to give The Great Seal (Skt. Mahamudra / Tib. Chag Chen) teachings. Lectures are open to the public, and no pre-registration is required to attend the course. Welcome! Mahamudra means “The Great Seal” and is considered to be the crown jewel of Buddha’s teachings. When one rests in the totality of the seer, what is seen and the act of seeing at all times, the goal, Mahamudra, is reached. During Great Seal Courses, Lama Ole describes the progressive stages which lead to this state and also guides his students in various meditations throughout the course. There are only very few schools of Zen and Tibetan Buddhism which have succeeded in keeping these teachings alive until today. Lama Ole Nydahl and his wife Hannah received the transmission of the Great Seal from the head of the Karma Kagyu lineage, the 16th Karmapa Rangjung Rigpe Dorje (1924–1981). Translation: Lama Ole Nydahl’s lectures are in English, and they are translated simultaneously into Finnish. For more information, see our Finnish page. Please note that you may not stay overnight at the venue! Bus 615 or, at night, bus 620, or by the Finnair City Bus. Read more. How to Get There from the Central Railway Station? NB: There is no parking for the public on site, so you are strongly advised to use public transport to arrive at the venue. Unfortunately, it will not be possible to visit, or stay overnight in, the Helsinki Diamond Way Buddhist Centre on 11 –14 October. If you plan to stay in a hostel or a hotel, please book well in advance.